What DX10 cards lack in performance, they make up for in stunning DX9 credentials, at least at the high-end. The midrange is another story - after a thorough examination of the other cards on offer at its price point, I'm less impressed than I originally was with Nvidia's 8600GT chips, given that it's outperformed by the ageing but still surprisingly spritely Radeon X1950 Pro. And so we come to ATI's response: the HD2600XT. Given the impotent competition in the DX10-compatible midrange arena, surely it won't be hard to rack up a few marks? Apparently so. For in terms of games and frames, the HD2600XT can't even match the lacklustre strokes of the 8600GT. How can this be? Performance never, ever gets worse with new generations of graphics hardware. This time, both NVIDIA and ATI have managed to buck the trend, and for once that really isn't a good thing. Architecturally, the HD2600XT appears to be pretty much sound. One hundred and twenty stream processors, 256MB RAM, and stock core and memory speeds of 800/1100MHz at least hints of something juicy. Sadly, the memory bus is a weedy 128-bit - the same as the 8600GT - and given that the less-than-stellar HD2900XT featured a 512-bit bus, one immediately feels the eyebrows dropping. Another key comparison point is the number of ROPs - 4x2, rather than the HD2900XT's 16x2. Small beans, you'll agree. Somewhat curiously, the card doesn't require any powering beyond that from the PCI-E bus; no six-pin plug socket, not even a winky-wee Molex. On the one hand, this is a good thing; less power consumption means a more efficient PC. On the other, it's a worry - 65nm production process aside, exactly how much clout can an unpowered card really muster? And the answer, unsurprisingly, is not much. The HD2900XT has been launched at a near-identical price-point to the 8600GT. And did we mention that card's middling games performance? ATI's new midrange offering can't match NVIDIA's effort in the framerate stakes. See the benchmarks over yonder, and weep. It can't even run Half Life 2 - a three year-old game, now - at better than 41FPS at 1680 x 1050, and it refused to fire up 3DMark 2006 on our test rig. An early driver issue, but the fact remains. In fact, we'd go as far as to say this is a budget card, not a midranger at all - it is less than £100, after all. Which means the only currently available unified-shader midrange card worth a fig is the 8800GTS 320MB. Given the rotten performance of high-end cards under the early crop of DX10 apps, we couldn't bring ourselves to try the HD2600XT out in this environment, so all the benchmarks you see over yonder were recorded under DX9, in XP. The card's saving grace is its HD video decompression. Unlike NVIDIA's 8-series cards, it can decode VC1 completely on the GPU, which means your processor is under virtually no load while watching Blu-ray movies or hi-def movie files. That's assuming you've forked out the king's ransom required to net a Blu-ray player. And an HDCP-compliant monitor. And you've managed to get all your HDCP components to talk to each other properly. Actually, it's suddenly looking like considerably less of a selling point. Although it does ship with a nice DVI-to-HDMI converter in the bundle. So at its price point, how does it compare with competing cards? Well, It's outperformed by the 8600GT in most games, and frankly torn to shreds by ATI's previous midrange hero, the still-awesome X1950 Pro, which is available for a mere tenner more. The X1950 has fewer bells and whistles, granted - no native HD decoding, no unified shader paths, no tessellation engine or geometry cleverness - but its raw grunt in DX9 games makes it a better gamer's card, pure and simple. It's early days for unified shaders. Right now, we have no 'proper' DX10 games - only bolt-on patches for existing titles, which is no kind of solution at all. The pitiful performance you'll see in these titles makes every DX10 card out there seem a colossal waste of money - and if high-end cards can't cut it, what's the hope for midrange and budget offerings? Until we see games that have been built with DX10 in mind from the very start, that's unlikely to change. The API is experiencing teething troubles of a lycanthropic order, and it's going to take a lot more time and even more money to sort that out. 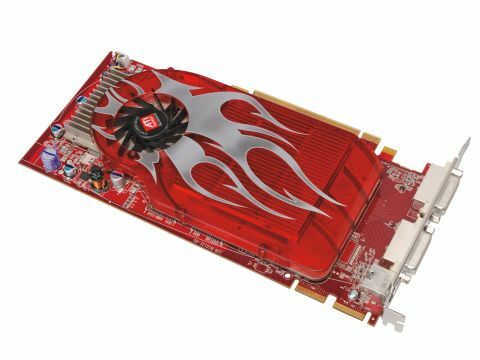 All of which leads us to the inescapable conclusion that, if you're shopping for a gamer's graphics card in the midrange, you're better off with one of the truly refined DX9 cards available - such as the X1950 Pro or XT. The HD2900XT would sit perfectly in a media centre system and is suitable for a bit of what the industry likes to call 'casual' gaming, but this is no true performance card.